After more than a decade of co-leading Tribal Tech with guitarist Scott Henderson, and their eight CD's, Willis has launched his solo career with the September 1996 release of "No Sweat." He's performed with Wayne Shorter, Allan Holdsworth, Hubert Laws, Joe Diorio, Robben Ford and Wayne Johnson. A Texas native, Willis studied composition and improvisation at North Texas State University. After moving to Los Angeles in '82 he became a course leader at Musicians Institute in Hollywood, and later taught at California Institute of the Arts in Valencia, California. Since Willis' move to Colorado in 1993, Warner publications has released "Bass Lessons with the Greats" which includes a his chapter on improvisation. Willis' 1991 instructional video is titled "Progressive Bassics" and later this year, Hal Leonard publications will release his "Fingerboard Harmony for Bass" instructional book, as well as a composition/solo book. 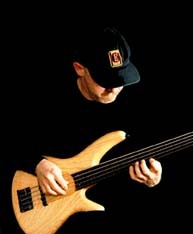 Two of his compositions are included in Sher Music's "The New Real Book-Volume Two", as well as a solo in "Concepts For Bass Soloing".